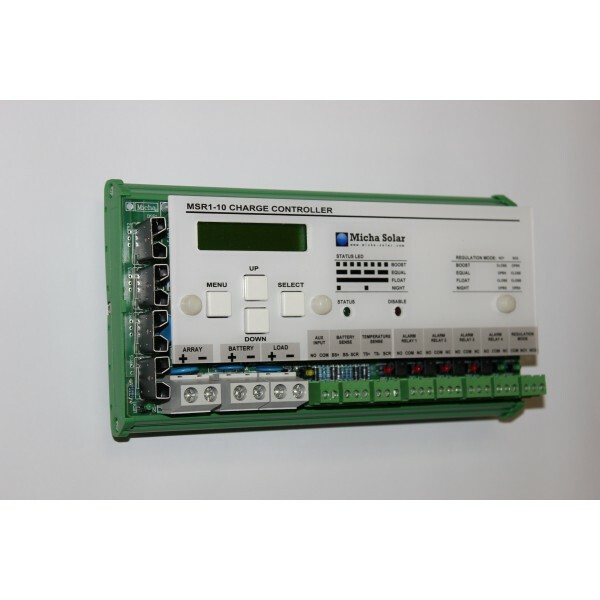 The MSR1-10 24V NE Charge Controller is a stand-alone solar charge regulator designed for use in industrial applications. 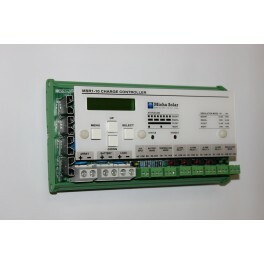 It features one Array Input rated at 10A and one Load Output rated at 5A (continuously rated). The unit is designed using well-proven technology and incorporates a 3-stage charging regime. Using remote Battery Voltage Sense connections plus an optional Battery Temperature Sensor, the maximum life and performance from the batteries can be expected. The unit features a 2-line 16-character LCD display and keypad. The end-user is able to view and adjust all regulation settings and alarm set, reset and delay values on site. Four programmable alarm relays with volt-free changeover contact and LED are included. The user is able to set which function activates which alarm relay, including Common Alarm, High Volts, Low Volts, High Temperature, Load Disconnect, Array Failure, Temperature Sense Failure, etc. The unit features an expansion port allowing connection of additional relays, optional RS232/RS485 communications port, 4-20mA transducers, etc..